Hot tub pumps are made to last. They usually outlast many other spa components since they are designed to run alot longer than they actually do in a hot tub. However, there are certain things that can reduce the life of a hot tub spa pump including poor water chemistry which can damage pump seals. Unlike 10 years ago, now discount spa parts can be found online and in many cases free shipping is also offered on these bulky spa pumps. 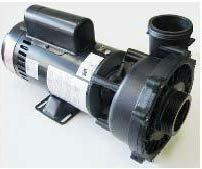 In the past, shipping a hot tub pump could sometimes cost more than the actual pump. Hot tub dealers and repair techs also marked up the pumps so they could exceed $500 or even $1,000. However, with the great levelling field of the internet, price transparency has never been so clear. If you need a hot tub pump replaced, they can be found online at many discount hot tub pump and parts online vendor sites including www.HotTubOutpost.com in the U.S. and pumps on Amazon.ca in Canada. There are also other suppliers in Asia, Europe and Australia. Even the U.S. and Canadian online stores offer 50hz equipment needed internationally. For the U.S. and Canada, 60hz pumps are the norm. They come in 110v or 230v and there are also two different frame sizes: 48 frame and 56 frame. Usually, reading specs off of the existing pump label can help find a suitable replacement pump. When replacing a pump, the connections should also be noted. There are 1 1/2 inch and 2 inch unions most of the time, and they can be arranged in several different configurations. If a connector is situated with one of the unions being at a 90 degree angle from where the standard pump suction or discharge is, the pump wet end can usually be rotated by 90 degrees and remounted to accommodate different plumbing layouts. When in doubt, email or call your online vendor and a replacement pump will soon be on its way. Getting a replacement pump does not have to cost the farm anymore, with many models in the $300 range, and free shipping too. With money being tighter these days, it does not make sense to waste $700 on a hot tub pump that you can get for half price. It just takes a little bit of legwork and knowing an online vendor you can trust. Then spend the extra savings on a great dinner out!